Greenhills Herald: Aoife Barry does another great report! Greenhills had a very busy few days recently, especially the Music Department! 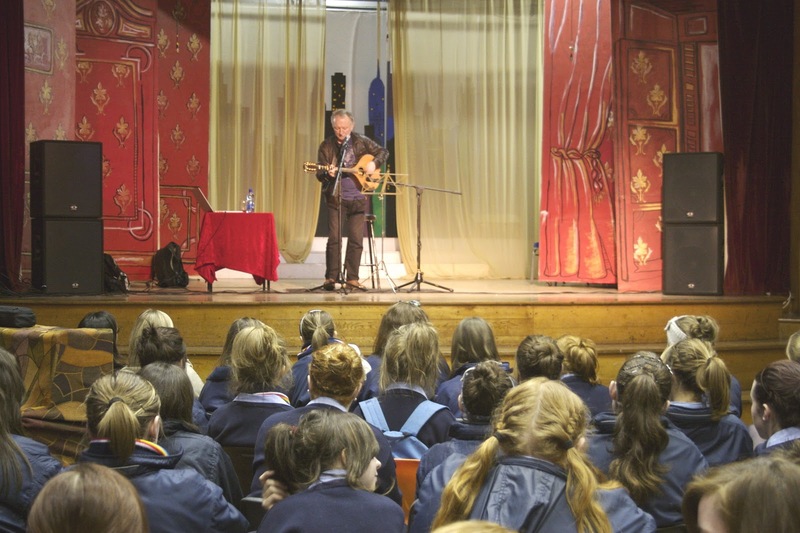 Firstly, on Friday last, the 16th, we had a very special visitor to the school: the very talented Donal Lunny of Planxty and Moving Hearts fame! Despite his high profile he was very down to earth and engaging. 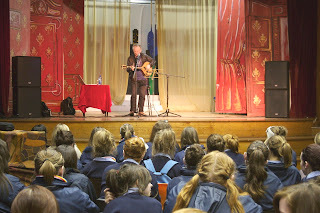 We were given a great insight into the Irish Traditional scene and treated to stories, jigs and reels. It ended with the school Trad Group playing a few Polkas with the great man himself! The Carol Service...Spectacular Art, Music and Dance! Then on Sunday18th the School Choir had their big CD launch in Scotch Hall!! We had a wonderful time performing for the Drogheda public and gave it our best shot with 'Africa' our iTunes single! It was a memorable experience for all! To top it off, on Tuesday 20th December, Our Lady’s College Greenhills held our annual Christmas Carol Service. This year’s service was a great success and was most definitely enjoyed by students, teachers, parents and visitors. The theme this year was ‘Love’, and with all of the heart decorations and the gym decorated beautifully, the theme was very evident. A big thank you is due to the Art Department for all their hard work on the decorations! During the service, all of the students and teachers received a good wish written by the students of the school. This went down really well and brought a lovely atmosphere to the carol service. Aoife and Amy doing their bit for charity!!! Art work.....detailed and intricate...wonderful idea! A big thank you is also owed to the Music Department for providing such beautiful music on the day. Singing all the traditional Christmas Carols and Songs as well as ‘All You Need is Love’ to fit in with the theme, they did a wonderful job of making the Carol Service an extra special event. The day did not end at the Carol Service, however! At lunch, many of the religion classes put together an event, ‘Winter Wonderland’, in the gym. With bake sales, live music, pictures with Santa, various games and even a teachers’ sketch this was a huge success! All of the money raised is in aid of SVP, a very worthy cause. I am pleased to say that we made over 600euro on the day alone! Excellent! The festive spirit is without a doubt alive in the school with everyone excited for the Christmas holidays to come. A very Happy Christmas and New Year to everyone! Some very unruly girls.....especially that tall wan at the back!! Miss ni Bhri and Sheena.....well done on all the mince pies!!!! As usual Hannah O Brien sang like an angel! !